Even if you are studying in most popular and excellent college of your city, even if they are providing best emergency services, alert systems, clinics, and precautions to their staff and students, you can’t call yourself completely safe from criminal and natural crisis. They don’t give you warning in advance and even your college management might fail in giving you security from them. But if you are an iPhone user these mind blowing free applications will definitely help you to face these situations and show you the way to come out from those circumstances. Have a look. This application is provided my WEBMD. This application is free and will tell you about all the first aids which should be given to some injured person. Here you will get all the detailed information about them and one might not get to go to clinic to meet solutions of those problems. But one must read them carefully to avoid some mis-happening. This application is given by PEOPLE GUARD. This application is free of cost but you have to pay a bit as subscription charges. Whenever you are late while returning home and you need urgent help this application will connect you to the security advisers and they will give you security tips as per required and if find something suspicious will immediately call 911 for help. I am sure now paying for this application is worth. This is an excellent application by HOLLABACK. This keeps all the records of criminal activities like rapes, assaults, street harassment, sexual harassment like place and whole story about how those crimes took place there. All information will help you in identifying odd and unfavorable situations and people around you and will help you in avoiding them. This is another important application by COMMUNITY SAFETY INSTITUTE. Here you can submit details about any local crime which you witnessed or you heard about. It will help others in knowing what is happening around them and what precautions they can have to be safe. A safety application given by EVERYBLOCK which is available only in 15 major cities. This app gets records from EMS, fire, and police reports and lists them by zip code so users can see what’s going on around them. But it is important that EveryBlock requires a free account of the user to get the most reliable possible services. 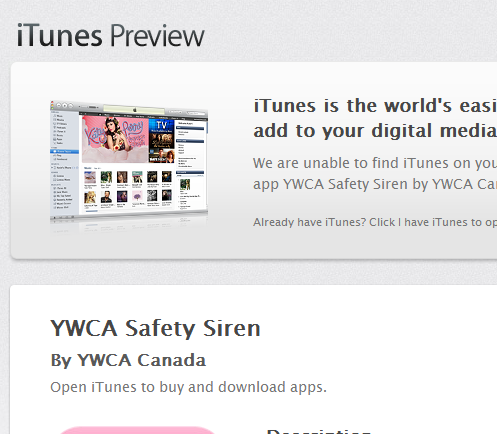 This application is provided by YWCA CANADA. The YWCA Safety Siren, available in both English and French, offers users a unique utility siren which can be activated by either the pressing the safety button or by shaking an iPhone. The app also offers Canadian health and safety information geared toward young women, including: short questions and answers about women’s health. This application is given by CRAIG HOCKENBERRY. Safety Light is not just the best flashlight in the iPhone App Store, it could save your life! One tap on the rescue icon and your phone immediately becomes a beacon that can aid rescue parties. The app also provides an SOS signal, lockable screen, and other features ensuring the most effective assistance possible. This is given by DEAN MANSHIP. The Campus Safety app for iPhone is a must have for every student, teacher, and parent. This application provides valuable emergency procedures and life saving information for 22 different hazards that schools from K-12 to colleges and universities face on a daily basis. The app contains emergency procedure information for all of the hazards like Active Shooter ,Biological Release, Bomb Threat, Chemical Spills, Civil Disturbance ,Contagious Disease, Crime & Violence, Earthquakes ,Evacuation, Fire/Explosion, Flooding, Gas Leaks , Hurricanes, Medical Emergencies etc. Also included with this app are access to countless emergency preparedness videos, current campus news feeds, access to emergency radio transmissions, and an emergency 911 phone dialing function built into the app. This is given by CAMPUS SENTINEL. Campus Sentinel provides students and parents with campus crime statistics, safety resources, and security news and information for more than 4,400 universities and colleges throughout the United States. The app provides the ability to compare institutions by self-reported crime stats across years and locations. This is given by FEDERAL MOTOR CARRIER SAFETY ADMINISTRATION. SaferBus App provides the general public an efficient way to view and access the safety performance of commercial motor carriers including motor coach and bus companies. How is the Internet Fun for You on Your Mobile?